Hotstar Android TV application, now available in Canada, India and the USA. Video streaming is gaining pace in India. Media consumers in the country have begun to move from live TV and set-top boxes to videos on their laptops, smartphones, tablets, televisions and multimedia broadcast boxes in the country, thanks to the speed of the Internet and bandwidth. Star India, one of the largest media and entertainment companies in India, launched its own Hotstar video broadcast application in India in early 2015. Its application was launched for iOS and Android, but not for televisions or streaming boxes. Now, the company launched its Android TV application not only in India but also in Canada and the US. 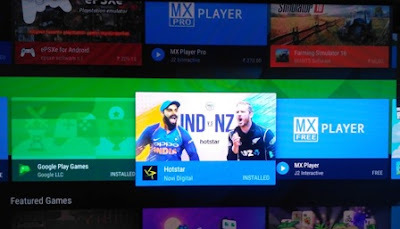 Hotstar Android TV application is now available for download from the Google Play Store and can be installed on Android TV, as well as multimedia broadcasts such as Nvidia Shield TV or My TV Box. This means that the Hotstar Android TV application will be used mainly on smart TVs based on Android TV from Panasonic and Sony, as well as on some TVs recently launched by TCL. It can also be installed in a decoder based on Android (Android Satellite TV Box, STB) from Airtel. It is good to see that the user interface of the new application of the company feels like the user interface of Android TV, with a row of cards divided by headers. Previously, if you want to stream Hotstar content on an Android TV, the only way is to use a Chromecast or a Chromecast Ultra since there is no Android TV application. If you had a TV with Android OS in your home, you could remove the Chromecast, since those TVs have built-in Chromecast, but you would still have to use the phone to browse and play content on the TV. Now you can use the whole application using the remote control of the TV to watch Hotstar content. Hotstar launched its application for Apple TV and Amazon Fire TV Stick earlier this year. The competitor of the company, Amazon, announced that it will soon launch its application for Apple TV.